August 22, 2012. 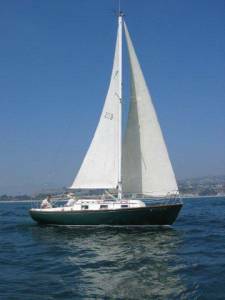 Kristin and Dave Keenan, current owners of Harbor Rat, O'Day #59, Wilmette, Illinois, have bought Serene from Bob Colson, Dana Point, California. We'll set up a new page for her soon. 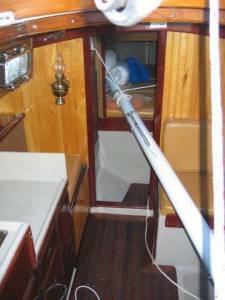 Webmaster Note June 15, 2013 - Click here to go to Harbor Rat Too. We wanted to let you know that we bought Serene (Yankee #239) from Bob Colston yesterday. We've had our eye on her for a while....and every time we looked, we got to talking (and talking). 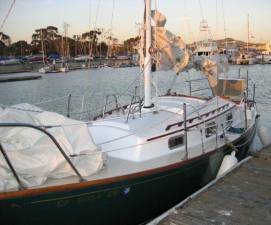 In the meantime, we got an estimate ($$$) on Harbor Rat's issues and then we talked some more. I will keep you updated. Always something exciting happening with Dolphins....that's a good thing! August 12, 2012. This is the link to an updated Craigslist ad http://orangecounty.craigslist.org/boa/3199688038.html - the price has been reduced to $8600. The updated ad appears below. Back on February 10, 2012. DFI Jonnie Walker (Madalyn Joy, Yankee #227) told us about seeing the Craigslist ad for Serene. • Hull has been re-gel coated. • Custom stainless steel bow and stern pulpits. • 4 new Anderson stainless steel winches (2 self tailing). • Stainless steel opening ports. • "Garhauer" blocks and vang. • New custom made masthead. 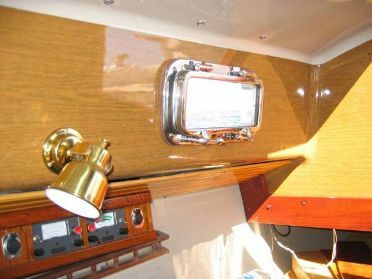 • Near new, custom made, SS Bimini. • Mercury 9.9 Hp, outboard engine, with 20 hours on it. • Luxurious interior. . . custom upgraded, by master wood craftsman. • New head. . . Never used. March 11, 2010. Dolphin Field Investigator (DFI) Glen Korpi, who also keeps his Yankee #146 AGAPE at Dana Point, originally told us of this boat. At one point last year when Glen was looking to find and buy a Dolphin 24 this boat, although not for sale, caught his eye. He also sent in some pictures. We reached Bob last night. He bought Serene for $2000 from the original owner in Newport Beach, CA. He has put several multiples of that number into her! She is pristine. He has had her for about 14 years. Her name when he bought her was also Serene. She does not have her name on the transom. 2 lower arrows - part of an A frame? upper right arrow - spreader bird guards? In his other life Bob is a cabinet maker so has a couple of legs up on the rest of us. His A-frame mast raising system looks pretty neat and I hope he will share more info about the design with us. Bob also reports seeing a Dolphin 24 in Long Beach, CA with an unusual raised house. 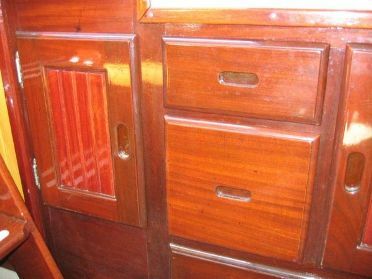 We hope to find out more about this boat soon. WE DID!! Click to go there!